Wow. I’m getting a late start on this post! Thank goodness my editors ( my husband and my close friend ) have not been nagging me! I guess my slow start is because yet again I’m in the midst of an M.S. drug change. My neurologist thinks we need to be a bit more aggressive in my treatment. I agree. I can slowly see myself losing strength and functionality. And the FATIGUE and weakness is unimaginable! Sometimes my husband has to help me bathe! Forgive me if that’s TMI (too much information!). So needless to say, I’ve been anxiously digging my way out of a little sadness. Something I don’t like to readily admit too! It’s easier to sometime write about though. Changing medications messes with me, because none of the options are fool proof. Don’t get me wrong. I know there is no cure, but can I at least get an injectable (shot) option that will not give me a cancer?!?!? Or a pill that I don’t have to take for the first time in the doctor’s office, because it may dangerously slow my heart rate! Now, that’s scary. In addition, I don’t even think that pill is specifically for my type of M.S., which is Secondary Progressive. So to deal with this I went to church at the historical St. Louis Cathedral here in New Orleans. It’s the oldest church in the United States. 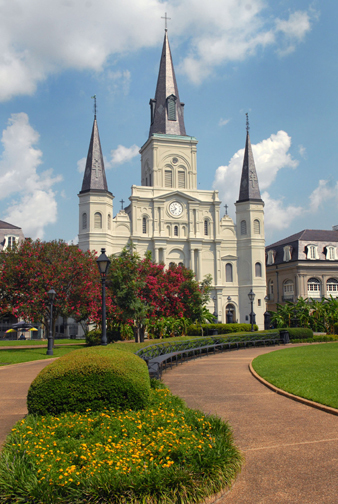 It conveniently overlooks Jackson Square which is next to the Mississippi River and the Jax Brewery Shopping Mall, Washington Artillery Park and shadows the French Market complex. On Saturday late afternoon my husband and I joined the tourists downtown and rolled to church. I have a feeling Tommy suggested this because the Saints play on Sunday! After, a nice inspirational talk from the priest, we left …and headed to the French Quarter! Funny, huh? What can I say? It’s New Orleans! Within, a few minutes, I looked at my empty lap and asked the dreaded question no woman wants to ask her clueless husband, “Do you have my purse?? ?” He didn’t answer, but I knew my purse had not only my wallet, but also his car keys and wallet as well. He didn’t say anything, but did a 180 degree turn and we dashed back to the church! To be clear he ran while I held on for dear life! We were both frantic and scared it was gone. I was looking in the crowd to see if I spotted it on anyone’s shoulder, female or male! I managed to mumble at least it was in a church. Tommy didn’t crack a smile. Which medicine do I take? We made it back. He was sweaty and I was wind blown. The priest had my purse! Everything worked out as it often does. I guess I’ll make the right decision about my medication too. I’ll let you know how it works out! It is so comforting to know that it isn’t just me that struggles with the whole drug decision thing. I’ve been on Avonex forever (with a brief Betaferon respite but my skin didn’t like that at all). Now my Neuro wants to try more ‘aggressive’ therapies. Like I said, it’s good to know so many others have the same issues to deal with. Yep. Same issues on this side of the ocean too! I haven’t had a chance to stop by in a while. Hang tough!! Shawn, No worries. You still get an A+ from me! I ALSO HAVE SPMS & HAVE BEEN ON EVERY CRAB DRUG, TYSARBI & NOVANTRONE W/O ANY SUCCESS…OF COURSE THAT IS FOR ME. WE ARE ALL DIFFERENT AS I TELL MY SISTER WHO ALSO HAS MS, RR, BUT NOT TO MY DEGREE. NOW MY NEURO WANTS ME TO DO THE SODU THINGY AGAIN. MAYBE I’LL HAVE BETTER LUCK THIS TIME! KEEP UP THE BLOGGING, IT IS GOOD HEARING ABOUT OTHERS DAILY LIVES. Looks like I’m going to do the pill. Your sister has it too?!!! I wonder if my sister worries about getting it too? Anyway, I said it before, blogging seems to help us both! AFTER THE SODU THINGY, I AM ALSO DOING THE PILL THINGY. MAYBE WE WILL BOTH HAVE GOOD RESULTS THAT WOULD BE FANTASTIC! Kim, How long? Please stay in touch! My sister and brother have MS along with me. No other relative that anyone can recall on either side. I’ve never in my life heard of such a thing. Talk about a support group! Are you all at deferent stages? My brother was diagnosed 21 years ago and walks with a walking stick. My sister was diagnosed 3 years ago with numbness issues. I won the progression prize in the family—-6 1/2 years and on a slippery slope. That is unheard of! It kind of reminds me when my doctor first dx’d me repeatedly saying,”But African -American usually don’t get this.” I remember wanting to slap him! I should have mentioned this earlier. When you change meds, do you look them up on patientslikemme.com? I’ve found the site to be very helpful in learning what I could reasonably expect both good and bad from a new drug. It helps dispell some of my worries and tempers some of my enthusiasm when I look at the efficacy, side effects, length of time taking, and reasons for stoppage for other MS patients who have taken the drug(s). In any event, I suggest that site for all those wondering about their medication and dosages. That’s a good idea. Yes, I’ve been there before. I shall return. I’m on Avonex, but have the same dilemma many MSers do I’m sure – the knowledge that things are (slowly) deteriorating but no idea if it would be happening faster without the drug, or whether a change of meds would work better. I guess we have to trust our neuros, and keep researching independently. Hope the change of meds works for you! Thats’s exactly what I have planned. Gosh, I’m so glad your purse was found…and that you had an enjoyable afternoon. New Orleans is magical and I envy you living there. Stress is the bugaboo for me too. I think having a Blog is helpful for you and VERY helpful to me too. I always enjoy hearing what’s going on in your world. Good luck on the meds changeover. Hey, whatever works, eh? Thanks for reading! It’s hard to imagine someone enjoys hearing what’s going on in my world!! Who knew?? This med thing in driving me crazy! I’m in the midst of the same decision regarding meds. The aggressive option that was suggested to me was some type of chemotherapy. I’m still waiting to hear from my neuro. on this. Avonex…Tysabri…Chemo?? If they do an autopsy on me when I die I think my insides will explode. Glad I found your blog. You express the views of many. Thanks. Mimi, The autopsy bit brought a welcomed laugh. Thanks! I update the site on Tuesdays. I can’t wait for you to come back! The fact there are no clear cut drug decisions with MS can often really get me down too. Like you I wish the ‘cons’ to the more effective drugs were not so considerable! Let’s hope things improve in the next few years, it’s interesting to see some of the news from ECTRIMS. The other angle on this, which is so clear in your post, is how much is left to the patient to decide. I think the burden of this on us, can be underestimated sometimes. Sometimes you just want a ‘higher authority’ to tell you what’s for the best- in this case God! I hope you found solace in the cathedral it looks beautiful. I am also wondering whether to go for a more agressive treatment and am slowly coming round to the idea of Tysabri. I had the tests for the JC virus last time I was in hospital. We shall see..! New Orleans sounds incredible. Immersing yourself in a place you love seems like a good way to cope with rough patches. I never thought about it like that …”immersing” myself in a place I love . Your right that’s gotta be good! I think I’ll go out for halloween after all. I know how hard this is. I decided to “just say no” to DMDs and everything that follows them. I’m having a great deal of success with five-element acupuncture, dairy-free diet, and some help from some excellent herbalists and energy workers. But that’s what works for ME… your mileage may vary, as the saying goes. But even the makers of the DMDs can’t tell YOU whether they will help YOU, or even if they HAVE helped you. But side effects? Yeah, that they’re sure about. But with this disease, what works for YOU is what works for YOU, and that’s all there is to it. Good luck! Thanks for the insight. I usually think in terms of “what I should be one” not so much as what’s working got me. That’s a simple piece I tend to overlook. Have been REALLY lucky in that the Betaseron they put me on from the get go seems to be holding strong. 5 years next months and I’m still not used to…or should I say…confortable with giving myself shots. But such is life. On my last check up though, he did mention my “exasaerbations” (Man, I dislike that word) seem to be getting closer together…so the day may be comming when I will have to try something else. What is always in the back of my mind is though…I lost the sight in my right eye to the MS beast…everytime I feel the slightest goofy thing in my other eye my stress level goes through the roof and I think that brings on even more stuff. Thanks for the encouragement.. 5 years? Impressive! It certainly sounds like you are doing something right. Fear. That may just be the one thing that all MSers share in common! There’s so much to learn. There’s so much to investigate. nicole, good luck with the med change, i’ll be praying for you!…actually, i seem to have found my ‘miracle drug’ (for now, anyway…)…20 mg of prednisone every day…helps my attitude, & helps me gain weight (3 lbs in 2 wks! )…i had to beg my neuro to let me do this b4 i tried the ms chemo drugs, but she was ok with it! Prednisone? Really? Wow I thought we were all taking Solumedrol. Good luck on your search. Sometimes it seems like searching for the Loch Ness Monster. I’m like Laurie…clean now for three years. Was it a wise decision? I don’t know. I’m still progressing…but I was progressing while I was taking meds too. So who knows. I just try to remain active, eat right and be the best person I can be. Wow. That’s a big deal. You are still progressing yet still not taking MS drugs? Sounds brave to me. But you are right I am still progressing with meds on board. I am a big believer in attitude. I saw your post mentioned on wheelchair kamikaze’s blog, and I’m glad I came to read. Your posts on the emotional side of discovering MS ring very true. I dread lsoing the ability to drive myself. Heck I was in our house for 2 days, and I felt like I was going insane. Good luck on the med change. I aways seem to have problems deciding whether a new med is helping or not helping as part of me is always trying to figure out if what I feel is a placebo effect. I know it’s stupid because even if it is a placebo effect, what’s wrong with that? I mean my hands aren’t actually shriveling to a ball, they just feel like it. So what if a drug isn’t actually unshriveling my hands that never really were. Why shouldn’t imaginery pain be stopped by imagining a drug works? Thanks for stopping by. I’m glad you get my point. I put out new posts on Tuesday. As for the med thing, my doc is pretty sure the new pill is the best bet option, but I always wonder if they have ulterior motives. I’m sure you’ll let us know what you decide about the drugs – and if you find something that helps. After running the gamut of DMD’s and some controversial drugs too, I’ve gone clean.And feel better for it. But I’d be up for trying anything that might help. Good luck to you, Nicole. I greatly enjoy your posts. Thanks! There’s nothing I would like more than to be drug free! Laurie, Thanks for reading. Writing helps more than I could have ever imagined. The drug…I’ll tell ya as soon as I know. i do think medications to treat symptoms is great… at least we can feel somewhat “normal” while on this journey… although it’s a synthetic normal that isn’t close to feeling remotely human ha! Sherri, The bottom line is. I’m just scared. I think you made a fine point. I’m not sure if any doc really knows what to give us! Medicine decisions are difficult. I just had to make one about Lupus drugs a while ago. I too think you should go with your gut feeling, and take your time making the decision. Karen, You are right, although I am anxious though! Good luck with your decision on your meds change choice. I am sure you will listen to your gut and do what is right for you ! What a beautiful church that is – I am glad to know your purse was with the priest :)- a good sign ! Kat, I now close call!